I’ve been taking cucumbers for granted as the boring, flavorless vegetable I occasionally dip my hummus in. That is, until recently when I rediscovered their impressive health benefits. Go grab a cucumber and let’s put half of it in a smoothie, and the other half on our face, shall we? This 6-ingredient, 5-minute smoothie was inspired by the wonder food that is cucumber. They’re also a secret weapon for nails and hair, thanks to the nutrient silica, which helps them grow strong and shiny. And because of their cooling and calming effect, they are excellent at calming stressed or sunburned skin and reviving puffy, dark under eyes – simply apply fresh sliced cucumber to soothe the affected area. So whether you’re consuming cucumber or putting it on your face, the benefits are real, people. This would be the perfect smoothie to add to your weekly line-up for breakfast or post-workout snacks. Pineapple and banana add citrusy sweetness, coconut milk lends to a creamy base, lime zest and juice offer plenty of bright citrus notes, and cucumber adds a subtle earthy flavor with a slew of health benefits (see above!). If you try this smoothie, let us know what you think! Leave a comment, rate it, and don’t forget to tag a picture #minimalistbaker on Instagram so we can see what you come up with. Cheers, friends! 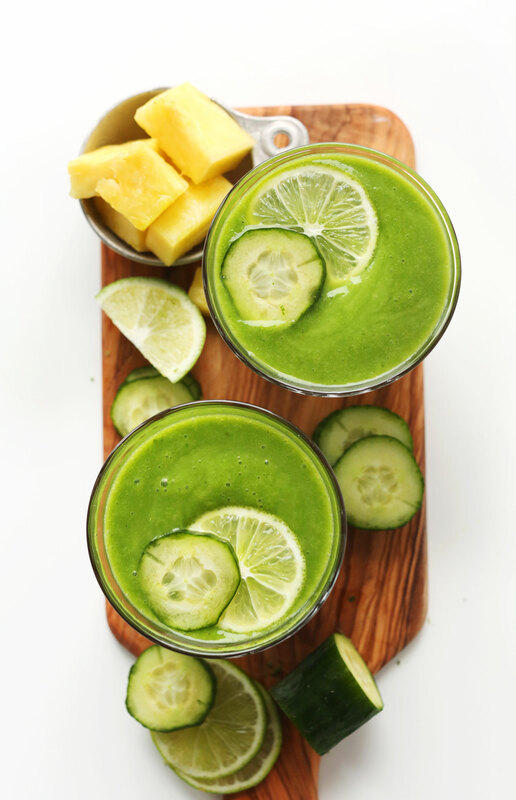 A creamy, 6-ingredient cucumber smoothie with coconut, lime, pineapple, and greens! A nutrient-rich, refreshing smoothie that will beautify you from the inside out! For a thicker smoothie, add more ice. For a thinner smoothie, add more liquid of choice. Taste and adjust flavor as needed, adding more lime juice or zest for acidity/brightness, banana or pineapple for sweetness, coconut milk for creaminess, and greens for more intense green color. * For creamier smoothie, use canned light coconut milk. For a lighter smoothie, use coconut beverage from a carton or sub coconut water! *For added protein, add 1-2 Tbsp (amount as original recipe is written // adjust if altering batch size) hemp seeds or chia seeds, or your favorite neutral or vanilla-flavored protein powder. I don't have any favorite powders at the moment, but Vega Viva Vanilla is the closest thing to palatable I've found. I didn’t have any pineapple on hand so I subbed frozen mango instead and it was delicious. This was most refreshing. I omitted the coconut milk and just used water as my liquid and added romaine lettuce. A great change from my regular smoothies. This is definitely one of my new favorite smoothie recipes! I’m not a huge fan of cucumbers but I am drowning in them from my weekly farm box. This is the perfect way to use them up! I legitimately made this for breakfast for a full week as the summer heat starting hitting my NYC apartment. So refreshing & as someone who doesn’t like sweet breakfasts, it had the perfect mix of tangy-ness to balance that out. I don’t have a high speed blender so the color didn’t look as beautifully smooth, could still see lots of green bits from the spinach, but it still tasted awesome. I love this smoothie – it’s so refreshing and light! I’ve made it quite a few times now and find that adding a kiwi and some fresh ginger are great additions if you already have them in your kitchen! Wish it wasn’t so high in Carbs 52g is a lot of sugar. This was fantastic! We didn’t have coconut milk or water, so subbed soy milk and it was delicious! Excellent. 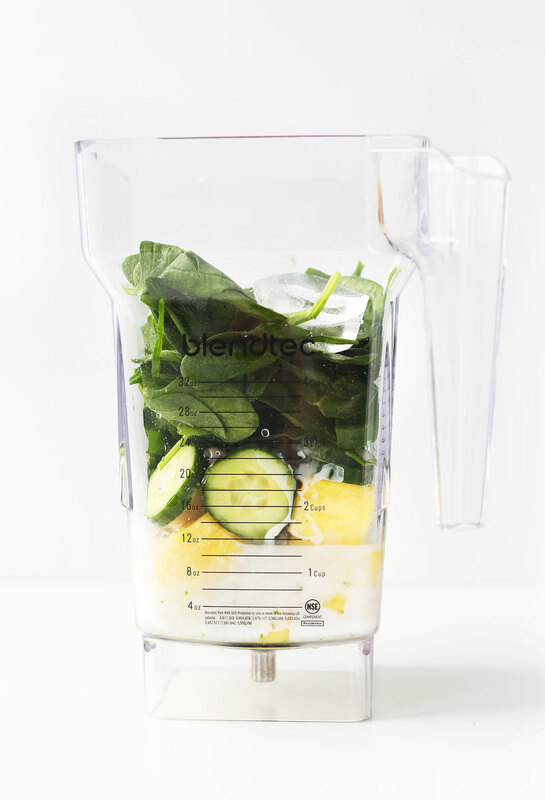 So convenient, I can place all the ingredients into smoothie cup, blend and go! Can you make some recipes for smoothies without banana? They’re so hard to find! Hi Catherine! Most of the time you can leave the banana out, but I will add it to the recipe request list! I made this three times because I was so determined to get it right! I finally did – added a bit more banana to sweeten as you said and I love it! Such an easy way to get all these great fruits and veggies in!! Thank you as always! The most refreshing smoothie I have ever had. I love cucumbers now!! What if life didn’t give me a lime or lemon? Will using an orange work? Fantastic and delicious smoothie! I added a scoop of Vanilla protein to it as well. I’m addicted to smoothies in the morning, and this is by far the best recipe I’ve found to date. I highly recommend making this! I’m disappointed I’m out of cucumber and have to wait until I shop on the weekend to make it again! This was amazing! Followed recipe as written and I wouldn’t change a thing! Had it after my work out today and it was prefect for rehydrating and so refreshing. This will definitely be in my rotation more often! 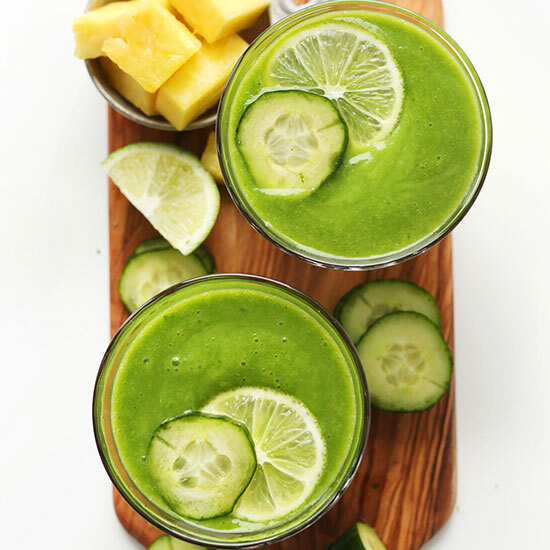 This reminds me of a more savory cucumber smoothie that i love- it’s one cucumber, a handul of cilantro, half a ruby red grapefruit, a tiny pinch of salt, and a few chunks of pineapple-i use frozen pineapple so the smoothie is cold without watering down with ice. It’s really refreshing and hydrating! This was delicious! I am not a fan of cucumbers and getting my kids to eat them is a challenge but this was a win all around! Thanks for a great recipe! This is my first green smoothie and Wow! I was so surprised at the amazing flavor. I can’t wait to make it again! Thank you for sharing! I think I over did the lime zest a little but it was otherwise filling and satisfying. Thank you for this recipe. The perfect light smoothie to go with our light lunch today. Yum. Yum. No mods needed. Do you think I could cook or omit the spinach? The cooked version is more digestible and nutritious than the raw one, unlike what most think. If I can’t do either, can I replace it with somethings else? Thanks! This is divine. I make it at least once a week now. I add a little more water and coconut milk because my vitamix won’t blend it otherwise. (Then again, it may be broken.) Thanks for sneaking green into my diet! It’s perfectly sweet without being sickly. I used coconut water instead of coconut milk and it worked a treat. A new smoothie for my favourites list. So refreshing and not too sweet! If you have a “high powered” blender (Vita-Mix, Blendtec or other) don’t bother seating the lime. Just wash it really well and toss the whole (or cut into 1/4’s if you prefer) into the blender. Just made this awesome smoothie and it’s absolutely delicious- thank you!! I tried it this morning. It’s so refreshing and delicious. Love it!! Thanks! I can’t wait to try this! Could I sub almond milk for the coconut milk? This was totally amazing! One of my new favorite morning smoothies for sure… I’ve already made it 3 times since you posted this…. :) Thank you, Dana!! Yum! My bananas weren’t ripe so I used half an avocado instead and extra pineapple for sweetness. Also tossed in some shredded unsweetened coconut. Next time I’ll go easier on the lime. Perfect summer time treat! Sounds so detoxifying and delicious! 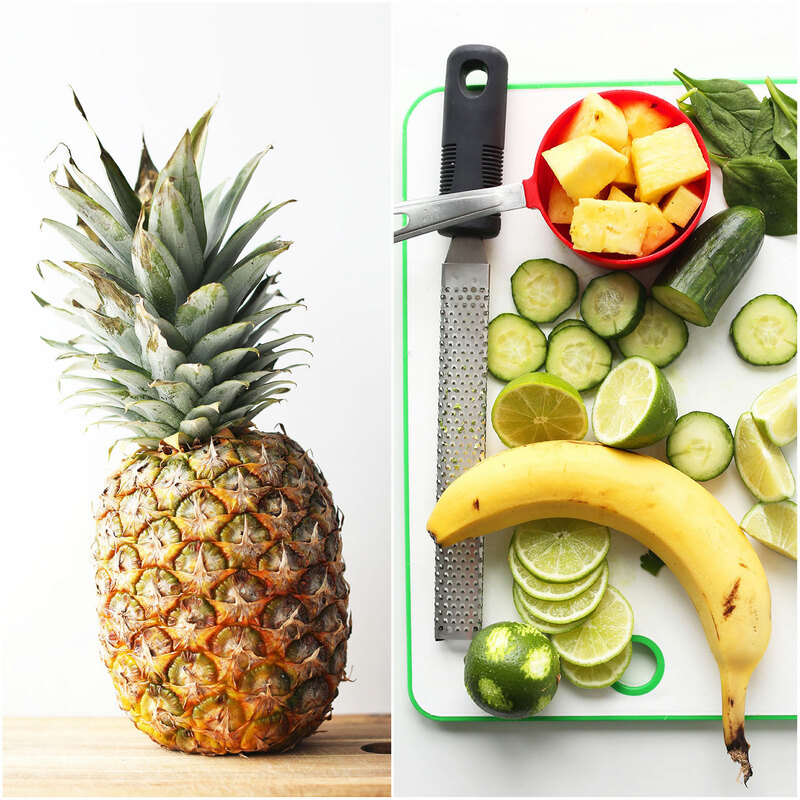 I love the fresh flavors of the cucumber with the pineapple as well! Had one for breakfast this morning. Delicious! I used the lime zest but then just finished peeling the lime with a knife and threw half of it right in, no juicing. 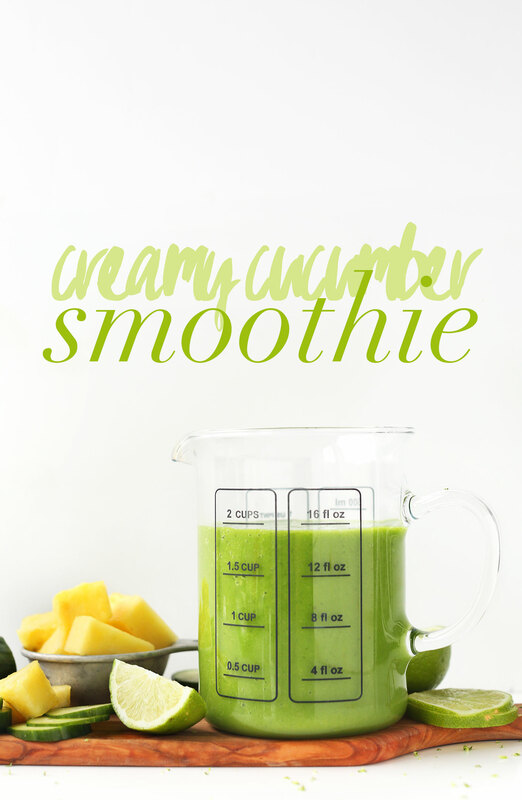 Just made this and it is really good and creamy and refreshing! Hubby liked it too!! Looking forward to getting your cookbook this coming week. I’m having a real moment for pineapple in smoothies. I love that I could pretty much make all of this now, so breakfast tomorrow morning is looking a lot brighter! I want to make this but don’t have pineapple. What about mango? Would the flavors go? Need an alternative so I can indulge this morning! This was a very tasty, cool, and refreshing smoothie. Trader Joes has the BEST organic cucumbers. Will definitely make this one again. Meant to comment: I doubled the recipe since you said it was for one serving and we both wanted it. It made 36 ounces! Do you really drink 18 ounces as one serving? I resisted using the cuke on my face (maybe someday I will do the thing with a cuke slice on my eyelids and pretend I am at a spa), but followed the rest of your instructions and got one delicious green smoothie! And green smoothies aren’t often my thing (but my husband and I trust you so much, thought we would try it). Our go-to whole fruit juice is what I call happy juice: 3 cups watermelon, 1 cup raspberries, squeeze of lemon and some agave. But now we will definitely alternate that with this. How is it possible to love all your recipes so much? I really don’t need another cookbook, but will be ordering yours tonight because your stuff is just the trifecta: healthy, easy, and delicious plant-based. Just made one this morning and it’s so GD good that I want to cry. A new morning smoothie for sure!! I Just tried out this recipe. It was delicious. Very refreshing and not at all sickly sweet. A perfect blend of flavors. Thanks! I have to try this, it looks so good!! Love this! It’s super healthy and filling, great start to your day! I’m not generally a huge fan of cucumbers. Their texture is so odd to me, and I they occasionally leave a weird taste in my mouth. But I make an exception for smoothies. It’s always sooo good! This was delicious! I added Vegan Vanilla Protein Powder from Arbonne and it was delicious! I only put in 1/4 of the banana though to keep the sweetness down with the addition of the pea protein. I added protein powder too, really delicious! How many scoops of arbonne protein did you use? This look delicious! I am wishing I had a cucumber on hand so that make this right now for my snack! I will need to make it soon. Wowza! This smoothie is Just what the doctor ordered! For once I had all the ingredients. It was So creamy and delicious that I even got my non vegan husband to try it. Guess who finished it up to the last drop. Yummilicious! Btw, thanks to you and your sweetheart for all of your hard work. Big big fan. Your recipes rock. Yes to all of this! The health benefits, the flavor combos…all of it! Can’t wait to try it! Thanks Tammy! xoxo Let me know how it goes! I just made this smoothie today and I love it! Yes yes and yes! Cucumbers in smoothies are thee best! Well I’ve clearly been under appreciating cucumbers. I’m sorry cucumbers, let me drink you now! I just tried cucumber in a kiwi smoothie the other day. It’s so refreshing! Ok, that just reminded me of Pride and Prejudice when Miss Darcy states….”Let’s take a turn about the room, it’s so refreshing” But I could see them downing these delightful smoothies!